Tasmania, for those who aren’t sure, is that little triangular-shaped island hanging off the south coast of Australia. I say little, but of course in true Australian fashion it’s actually a decent size- for our European followers, somewhere between the size of the nations of Switzerland and Austria, or about half the size of England. Or, for our American friends, a chunk smaller than the state of Maine. It has a population of about half a million people, roughly half of whom live in the capital, Hobart, on the south coast. Tassie is seperated from the Australian mainland by the heaving Bass Straits, a 9-hour ferry ride from Melbourne, and is plonked in the path of that belt of circum-polar winds known as the Roaring 40s, which belt both it and New Zealand (about 2,000km due east) with ferocious blasts of wintry air and drive a changeable and unpredictable climate consisting of large amounts of cloud, rain and, during the winter, snow. No, we didn’t see any. We did, however, see a lot of Tasmania in our six-day tour. And, belying the climatic trends stated above, we also had fabulous weather. A day and a half of somewhat overcast weather with a few spots of drizzle divided what was otherwise largely sunny with clear afternoons and marvelous cloudscapes which made landscapery a joy. I won’t be posting all of them here (although for those who are interested you can find a lot of them on the Morealtitude Photography Facebook page), but will put up a smattering of shots from the different places we went to for those who are interested, and give a bit more detail about some of the delights tucked away on this thoroughly under-rated little block of real-estate. Arriving off the ferry from Melbourne, we docked in Davenport and drove straight down to Hobart. The trip from one end of the island to the other takes about 3 1/2 hours if you take the main highways, and is an easy run. The roads (for the most part) are in great condition (we drove through the Great Western Tiers in the Central Highlands, where sections of the road are unsealed). The best bit about driving in Tas is the utter scarcity of other road users. Seriously, the place is deserted. From Hobart, we swung up the east coast, first hitting up the area around Swansea, and then up to Coles Bay and the Freycinet Peninsula. 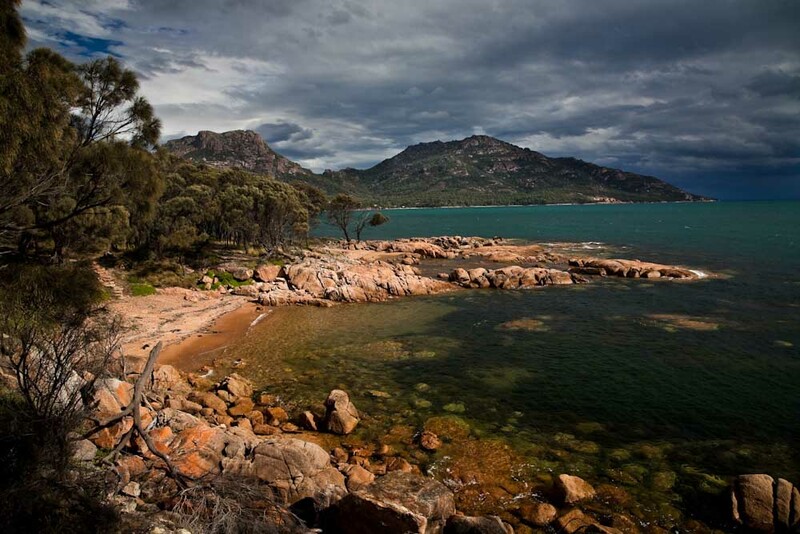 The Freycinet Peninsula is a spindly finger of mountains reaching out into the ocean, a rugged feature whose rocky abuttments are seperated by some of the most spectacular beach real-estate you’ll ever find. The water in the sunlight is clear as a spring and a turquoise so pure you want to set it into a ring and wear it away with you. Here we hiked into the spectacular Wineglass Bay before continuing northwards. Reaching St. Helens, we then continued up to the Bay of Fires, a stretch of remote coastline on Tasmania’s north-eastern corner. Listed by the Lonely Planet as its top destination for 2009 (I didn’t know that until somebody mentioned it today), Bay of Fires is actually a series of white-sand beaches and rocky outcrops, where azure waves of the most outrageous colour crash themselves into oblivion beneath a warm sun. Not as unpopulated as it may once have been, it is none the less an amazing location, and would be right at the top of my list for future visits. From the Bay of Fires, we stretched our last day in Tasmania into an epic marathon and swept in a single afternoon across to Cradle Mountain National Park. The heart of the highlands, the dramatic volcanic behemoth that is the park’s namesake stabbed upwards into a clear blue sky at sunset just as we reached the park, and the views were magnificent- and made the cross-country sprint completely worthwhile. A fitting finish to a beautiful little journey. I’ll go into a little more detail about some of these locations and photoshoots in later posts. Hopefully for now, this will whet your appetite for a little more. 1. Pristine waves wash onto the pristine beach of Wineglass Bay. 2. Blue skies and puffs of cloud support a leaning gum tree in a field in Tasmania’s rural interior. 3. The Organ Pipes, geological rock formations, atop Hobart’s Mt. Wellington. 4. An empty rural highway in inland north-east Tasmania. 5. The dramatic Freycinet Peninsula (behind) as seen from Coles Bay. 6. Clear waters in Biralong Bay, at the start of the Bay of Fires. 7. Cradle Mountain at dusk. 8. Lichen-stained rocks and azure waters in Wineglass Bay.